Last year, my husband finally bought a dishwasher. I always wanted one. Finally, I get that hour of my day back and my hands no longer suffer the dryness of being soaked in grease-cutting suds! Yay! That first week, I was confronted with the kind of burnt on mess that sometimes happens when you have a fifteen-year-old daughter with a love of stove-top mac and cheese. She’s learning to cook. I have to be patient. But, I don’t have to scrub dishes anymore – I have a machine for that! Most people will tell you that cheesy pasta burned into a stainless steel sauce pan isn’t going anywhere without a lot of elbow grease, but I’m stubborn. 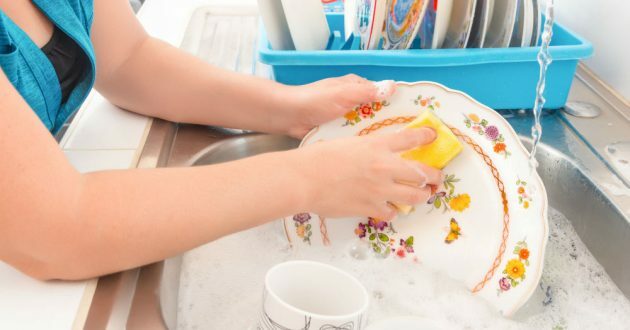 Whether stains and food remnants are burnt on or dried out on ceramic tableware, or metal cookware – I do not want to scrub anything by hand anymore. So, I tried everything to figure out how to maximize my dishwasher’s effectiveness. That’s how I learned that the type of detergent matters. The best dishwasher detergent can get the job done in a snap. High-quality products can handle the toughest baked on grease stains you can throw at them. Mediocre products take work to remove stains, are not kind on your hands. I may just as well be washing the dishes by hand! Choosing the best dishwashing detergent is the best thing you can do to maintain the life of your dishwasher and get those dishes squeaky clean, and you can do this by researching information about the products, carefully checking the labels, or by reading reviews. In this blog, I’ve put together what I learned this year about the best dishwashing machine detergent brands. I’ll admit it – I tried making my own dishwasher detergent. I tried a few different recipes from simply using liquid dish soap and adding baking soda, to a more complex concoction of washing soda, citric acid, and borax. In the end, I decided DIY isn’t as effective as the store-bought options and certainly wasn’t any easier. You won’t find homemade detergents on any of my lists of recommendations. After a lot of research on automatic dishwasher detergents I figured out why homemade detergents aren’t as effective. I haven’t figured out a way to delay the dissolution of disinfectants so that the enzymes have time to work at home. It doesn’t mean it’s not possible, but I haven’t seen the DIY recipe for it. For the same reason, powders, pods, and tabs tend to outperform liquids and gels in which all the ingredients are mixed and dissolve at the same rate. Whether you bought the Cadillac of dishwashers, a Miele Professional, or you got a good discount on an affordable countertop GE or Bosch dishwasher, how you treat your dishwasher will determine how well it functions and how long it lasts. 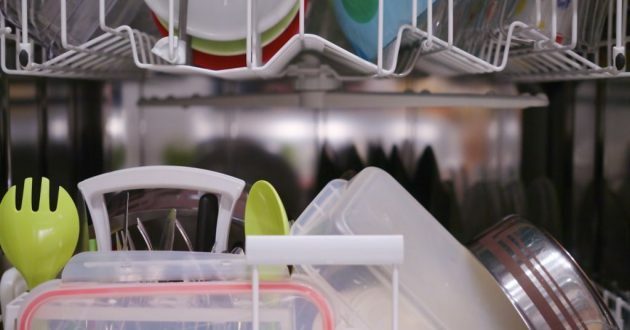 If you’re like me you want to get the most out of a relatively affordable dishwasher. The detergent that you use has a huge effect on how clean your load will be at the end of each washing cycle. It matters! One thing you need to figure out first is the type of detergent that you should not put in your dishwasher. Even though it might seem risk-free, it is not a good idea to use liquid detergents in the dishwasher. This type of detergent is usually for manual dishwashing and not for the appliance. 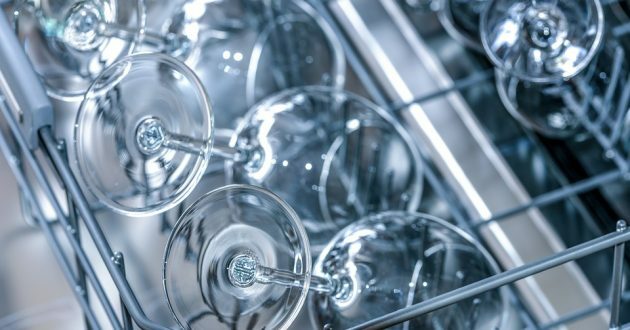 It may not damage your dishwasher, but it can make a huge mess because it can generate excessive bubbling that will seep out of the appliance and fill your house with suds. This happened once when I was little and my teenage brother ran our apartment dishwasher without knowing any better. If you make the same mistake my brother did, you can get rid of all those bubbles by using salt. The salt will settle the foam and make the whole cleanup easier for you to tackle. As mentioned earlier, there are a lot of detergents available for the unit today. Most people just buy whatever their parents bought, or whatever is advertised most effectively. 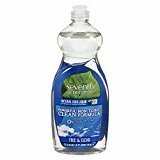 I wanted to do the research to make sure I could get the most reliable dishwashing detergents for the best value. 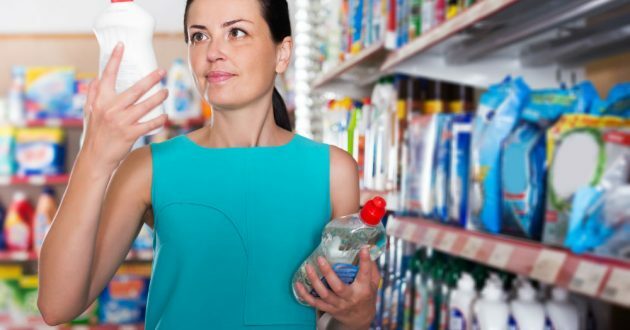 One common pick for most consumers are products with rinse aid. It is meant to draw water off from the tableware’s surface and stop the formation of droplets. Without water droplets tableware will shine, without water spots or streaking that sometimes make clean dishes look dirty. Use rinse aid if your dishes look spotty when they dry. Another product I can easily suggest, based on my reviews, are tablets. Tablets can save you money because they are all-in-one products that will keep you from having to use multiple additives for streak-free shine. Tables can be a convenient and practical solution to the unfortunate secret of finding the best dishwashing detergent: you often need to use multiple products. These can be effective for hard water or soft water and everything in between. However, is it important to know that in some cases using a tablet can void your warranty. Read your manufacturer instructions—following them will ensure that your dishwasher will stay in tiptop condition and will keep you from using any products that are recommended against for your particular dishwasher. To make sure that the dishwasher will do its job meticulously and retain its functionality, you can put salt in it occasionally. Like the salt used to soften water, dishwasher salt regenerates ion exchange resins and removes the calcium and magnesium ions that build up from hard water. Dishwasher salt should not harm the unit’s water softener compartment. 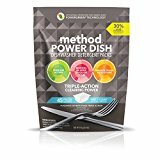 There are now products that will not require you to use dishwasher salt and this will allow you to save on expense and time. But like all products, you have to check out the instructions prior to using it in the appliance in the event that the product is not fit for it. This can get confusing because there are so many different products on the market. That’s why I’m publishing this extensive guide. Using the correct detergent for your dishwasher will guarantee that your tableware will be completely clean and shiny after a cycle. In case you are not sure about what product is great for your appliance, or what products are not suitable for it, check the manual that came with the appliance first before putting any detergent in it. Don’t overlook the dishwasher detergent compartment! I used to think this compartment was meaningless, and that I could just pour my detergent into the dishwasher and not bother with it. If you’re using a tablet (which are designed to have different ingredients dissolve at different rates) it may be less relevant, but your detergent compartment plays a crucial role in the proper functioning of your automatic dishwasher. Often when a machine starts to be less effective at getting dishes properly clean, the detergent compartment just needs to be cleaned or repaired. If you’re not latching your wash cycle compartment or just putting your dish soap into your open dishwasher then you’re letting most of your soap wash away in the prewash cycle. 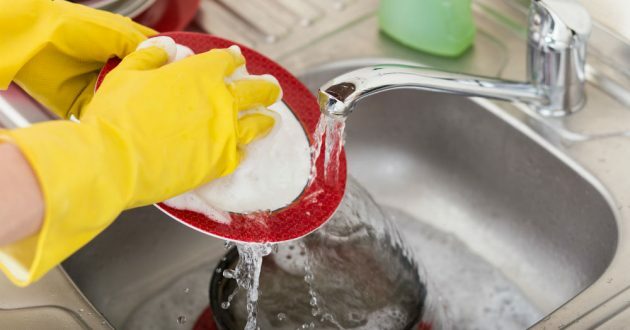 In this case your dishes aren’t getting as clean as they should and most of your wash cycle is using just plain water. If your detergent compartment is congested with gunk from the detergent and debris, make sure you clean it out manually! Don’t expect your dishwasher to clean itself just because you use it to clean your dishes – if you don’t take care of it, it won’t do either. Cleaning this part is not a labor-intensive job, in fact it’s quite easy and it will only take a few minutes of your time. If you notice that your tableware is not as spiffy it should be after a cycle, there is the possibility that the detergent compartment might be too congested to perform properly. Another indication of a blocked compartment is a surge in the amount of detergent you need to use. 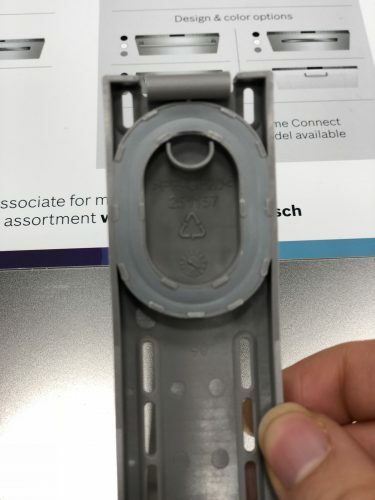 You need to inspect this part by first opening the appliance and finding the dispenser. 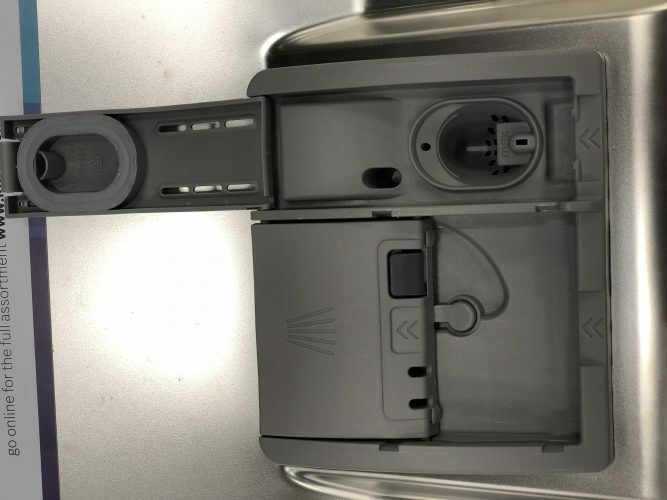 The location of dishwasher components varies from model to model, but it should be easy to spot. As soon as you have located it. 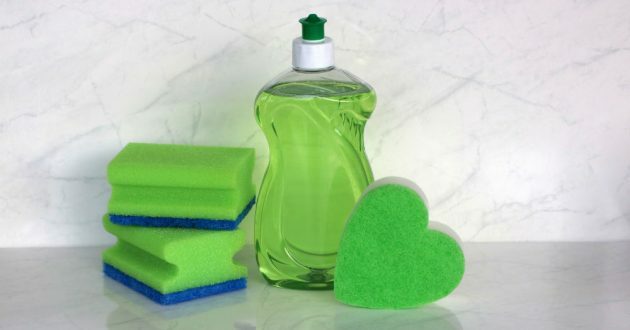 Remove any soap or detergent that may be caked inside of the compartment with a warm wet sponge or rag. Make sure that the area is clean before you put its lid on. Double check that the cover opens and closes easily and is not damaged or broken. If any of the parts are worn or defective you may need to contact the manufacturer or a local repair place to replace them. Once you’re sure that your detergent compartment is clear and operational; run a load of tableware to test whether the machine is functioning better. If your dishwasher is a little bit older and still not working properly after cleaning the dispenser, the next thing I would do is check is the gasket which is located over the detergent container. 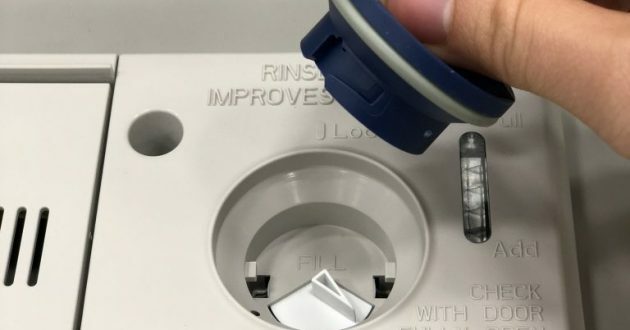 This gasket keeps the water out of the compartment during the prewash cycle, making sure that your wash cycle detergent is released at the appropriate time. With frequent use, this gasket can deteriorate and slacken over time, therefore decreasing the effectivity of the appliance. To deal with this, you need to replace the gasket. You may want to call a repair man for this, but if you’re handy you can probably do it yourself. You need to inspect the gasket for breakage or cracks. If it is damaged, it will have to be replaced. However, if the gasket only displays signs of dirt, you only need to remove it from its place, clean it, and then place it back in position. These are the steps you need to maintain your dishwasher soap dispenser’s functionality. The proper maintenance methods will keep it working effectively for a long time. We have discussed what you need to know about dishwashers and the detergents that work with them. Now it is time to make a few recommendations of products that may fit the workings of your dishwashing unit. Are you after a product that is free from phosphates and other related harmful ingredients for your dishwasher? 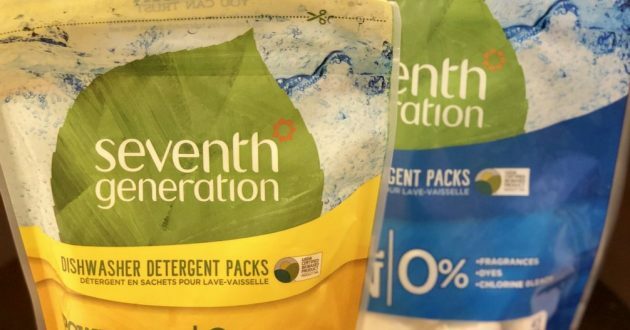 Check out the features of the Seventh Generation Natural Dishwasher Detergent. It does not have chlorine or phosphates, items that are known to be risky to the environment. Phosphates were once used as a builder in most detergents years ago due to their superior cleaning performance. However, they can damage water resources and kill lakes, ponds, streams and other bodies of water. Thus, countries enacted laws to ban the substance and instead rely on other safer alternatives. This product makes use of a high-quality enzyme system which can tackle even the driest and stickiest of foods left on cooking equipment and utensils. It is capable of rinsing clean and it is all-natural to boot. It does not contain any artificial dyes or fragrances and instead is scented with botanical extracts and essential oils. This is a formula that is completely non-toxic and will never emit strong fumes that can fill your kitchen with unpleasant smells. Powder-type dishwasher detergents are one of the easiest and most affordable cleaning agents for your dishwashing needs. 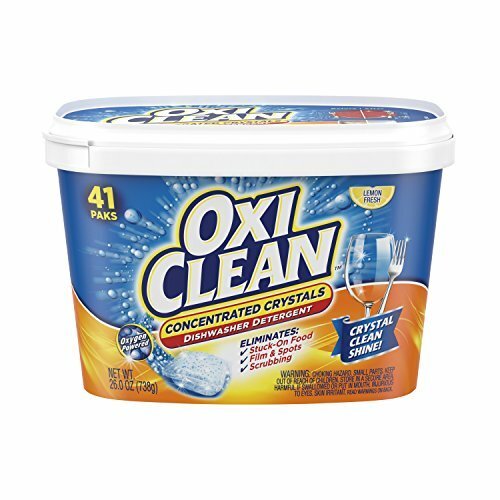 This OxiClean Extreme Power Crystals Dishwasher Detergent is something you ought to consider if you are after a powder cleaner. Powder can be poured straight or scooped into the detergent container inside dishwashers. They are practical and are suitable for homes that do not have too many dishwashing tasks. It can capably remove stains, and rinse off is fast and easy to do as well. If you tackle lots of pots and pans, powder cleaners are the way to go. This OxiClean includes a good 32 loads which translate to plenty of washings. It has concentrated crystals which can manage tenacious stains and grease. You won’t have to worry about any food residue left on your cutlery and cooking equipment with this product. In addition, you only need half the amount of the powder for regular and bigger dishwashing tasks. It also gives your cutlery a nice shine after a cleanup. Just make sure to follow the instructions provided by the brand and you will be assured of a washing with less fuss. Nowadays, people are becoming more aware of what they eat or use on their bodies. This extends to cleaning products, and rightly so. Detergents used years ago included phosphates and other ingredients that have the potential to harm not only our bodies, but the environment as well. Thankfully, today we have companies like Grab Green who constantly produce cleaning agents that are safe and free from toxic ingredients. 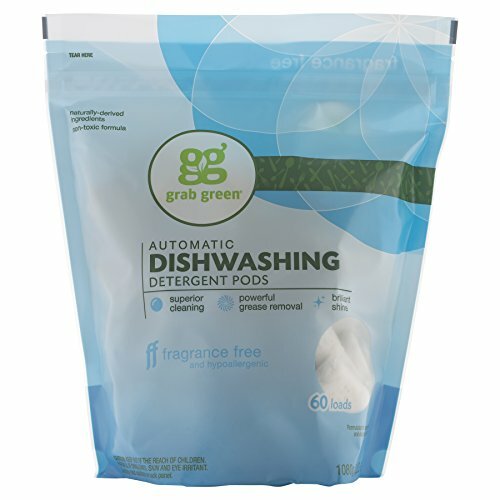 The Grab Green Natural Automatic Dishwashing Detergent Pods aim to efficiently clean your tableware and cookware in a fast and easy manner without the odors and the damage that traditional dishwasher detergents do to the environment. The product comes in pre-measured pods and will not bring about waste or messes in your kitchen. It will not leave any residue on your plates. The formula it has is completely natural, derived from plants and minerals. It is not tested on animals, which is another big plus of the product. It is safe for all septic systems, free from GMOs, additives and fragrances and comes in recyclable packaging as well. 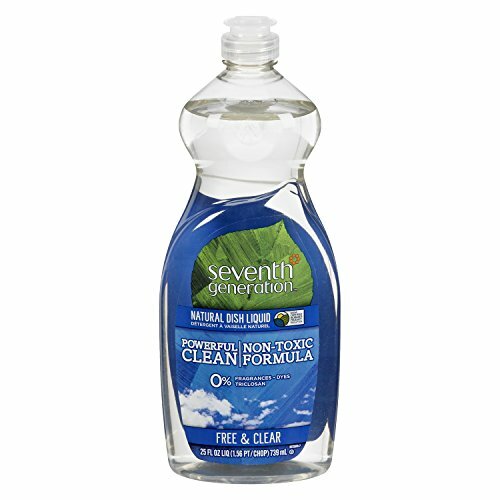 If you need a green and natural detergent for your dishwasher that cleans effectively, put this on your grocery list. Dishwasher tablets look like small bricks of concentrated detergent. Most consumers choose this particular type of detergent over the powder form because it makes for a less messy washing procedure. And because it is in tablet form, this means you will always use the right amount of detergent in the dishwasher. There won’t be any excess foam and leaks to deal with. You will always know the right amount as prescribed by manufacturer instructions as well. 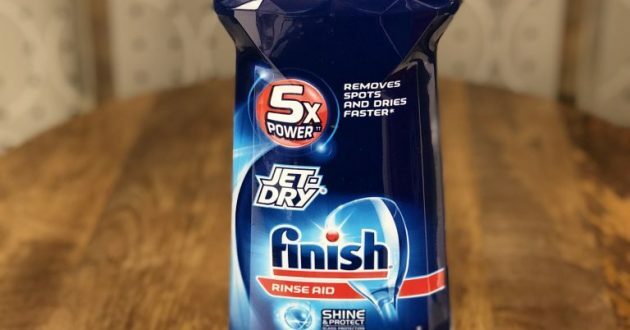 Now the Finish All in 1 Powerball Dishwasher Detergent Tablets is a product from a well-known brand of cleaning agents. This is one product that has strong cleaning capabilities; there is no need to wash or rinse before the task since it is powerful enough to cut through any kind of food remnants and stains. It can even tackle food that has been burnt on, or has dried on the surface of tableware or cooking equipment. It contains three times the concentrated cleaning strength of the company’s regular powder form detergent, hence it can remove tougher stains coming from tea and coffee products. The product comes pre-measured and individually wrapped. To use them correctly, make sure to use one tablet for each load. The tablets are safe for septic systems and this is another advantage of using it. Using a dishwasher means using a detergent that rightfully suits its functions. That is why it is important that consumers look into detergents for the unit with a critical eye since not all products are the same and made for all types of dishwashers. A great detergent will not only clean your dishes effectively, it will also maintain the functionality and integrity of your appliance. The Cascade Complete ActionPacs Dishwasher Detergent comes from a brand that is known in the industry due to their effective products, and this is another suggested detergent that performs well. The detergent comes with a formula that easily washes away and removes even the toughest of stains. There is no need to pre-wash items just to get that deep clean. It has excellent grease removal action and it leaves a nice sheen to your tableware right after. There is no residue left as well due to the Rinse-Aid action that the product comes with. The product is for the busy users who wants to their dishwashing duties over in a snap. The right detergent should suit your dishwashing unit well. 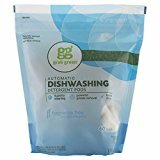 It is always crucial that you should choose the best dishwasher detergent wisely so the product can do its job well along with the dishwasher. Reading information about these products will help you find a good detergent. Check out reviews of your options and see which will accommodate your needs. Do I need to use a Rinse Aid?